Inbox 2.0 isn't coming, it is here. The web is waking up to email; I’m glad we had a 1 ½ year head start. In the winter of 2006 Adam was at MIT searching for a thesis topic. Adam’s research interests involve large scale systems, data mining, and machine learning. He was speaking with another graduate student, discussing sources of interesting data, and the conversation broke down to the following, which is one of my often repeated Xobni pitch lines: “How many kilobytes of data have you ever created on the web? Google has done a lot to organize that data. How many kilobytes of data have you ever sent or received through email?” It ends up that email contains significantly more information, yet much less has been done expose it. Enter Xobni. 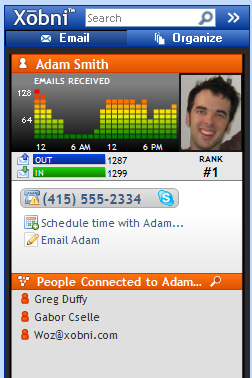 I was hooked on the idea of mining email data after a couple weeks of phone calls from Adam. I dropped out of grad school and moved to Cambridge within 2 weeks of first hearing the idea for what we then called “Inbox Advisor” and everyone now knows as Xobni. We realized after building Xobni analytics and playing with email data for 6 months that the most interesting data in email revolved around relationships. When we realized this, we began building Xobni Insight. To us, Inbox 2.0 means having organized context about a relationship made available from your historical email as well as the web. This is the product description for Xobni Insight. You instantly know the last time you emailed a person, and what you said. You see a picture of them. You see what friends you have in common. You see the pictures they recently sent you. Xobni Insight already offers a lot of this, and plans to offer much more soon. What I realized today, after reading much of the discussion on the web surrounding Inbox 2.0, is that in many ways what we mean is VCard 2.0. However, unlike VCards, Xobni profiles will be pull not push – you see the data when you want it, not when someone chooses to send it. Xobni profiles require much less work, which means people will use them much more. We don’t make you enter phone numbers; we automatically extract them from email signatures. We don’t make you list business associates; we automatically discover them based on your emailing patterns. We are currently working on pulling more information from your email inbox and from the web to further define your Xobni profile. Inbox 2.0 isn’t coming, it is here. This is really exciting stuff.